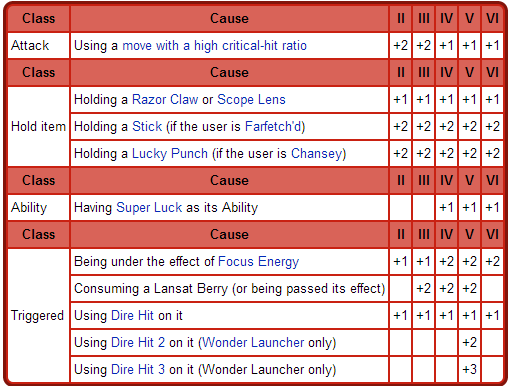 I know Farfetch'd can use the item Stick, but I'm pretty sure there are Pokemon that can have higher crit rates. Thanks! I am not going to choose a BA because I like both your answers, but I will give you up votes! Ability: Pokemon with the ability Super Luck have heightened critical hit ratios. It should also be noted that while Sniper does not raise the chance for a CH, it does make your attacks even stronger (triple) when it happens. >Using the move Focus Energy, as you stated, will raise CH chance. >A Pokemon holding a Lansat Berry, Razor Claw, Scope Lens, Lucky Punch (Chansey Only), or a Stick (Farfetch'd Only). The last two raise the Critical hit chance by two stages. >Using the moves Aeroblast, Air Cuter, Attack order, Crabhammer, Cross Chop, Cross Poison, Drill Run, Leaf Blade, Night Slash, Psycho Cut, Razor Leaf, Shadow Claw, Slash, Spacial Rend, or Stone edge will raise your odds. >Using the move Frost Breath or Storm throw will always result in a critical hit, barring of course, some negating ability (. >Using the item Dire Hit will also increase it. The highest stage you can get in Gen VI is an attack has a high critical-hit chance (12.5%) + Farfetch'd holding Stick or Chansey holding Lucky Punch (50%) + Dire Hit (12.5%) + Focus Energy (50%). With the focus energy stat increase. There are many Pokemon that can have a high critical it ratio. There are some who can achieve 100% critical hits. The Pokemon must have Super Luck/Focus Energy and must be holding a Razor Claw. They must also use a high critical-hit-ratio move such as Psycho Cut or Stone Edge. This causes every move to land a critical hit. For Focus Energy, you must first use it because it is a move. That's why Super Luck is preferred as it is an ability. Can Struggle get a critical hit?